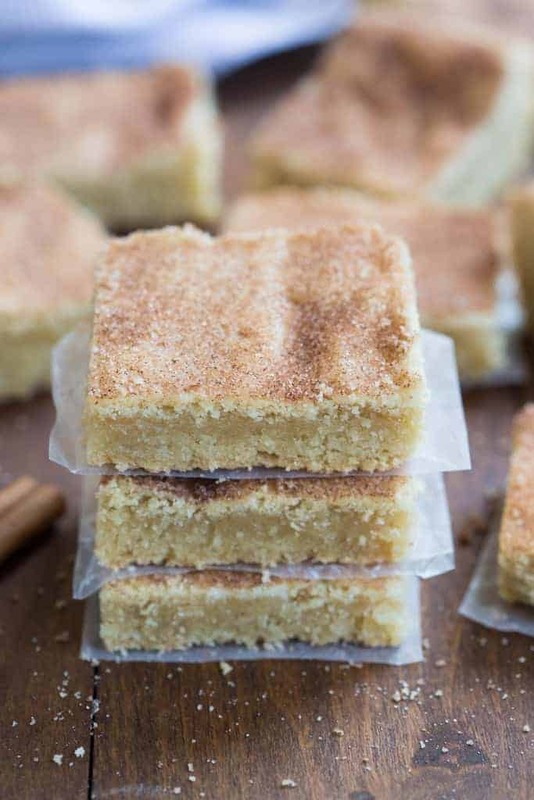 My favorite cookie recipe transformed into the BEST super soft and chewy snickerdoodle bars! No rolling or chilling the dough. These couldn’t be easier to make. I have a serious sweet tooth problem when the weekend comes. Give me all the sweeeeets! Usually I want to relax on the weekends so I want a treat that’s easy, has simple ingredients so I don’t have to run to the store, and obviously a treat that’s delicious! The dough for these cookie bars is just like snickerdoodle cookie dough. After you make it, you press it into the bottom of a 9×13” pan. Then sprinkle cinnamon sugar on top, and they’re ready to go in the oven. 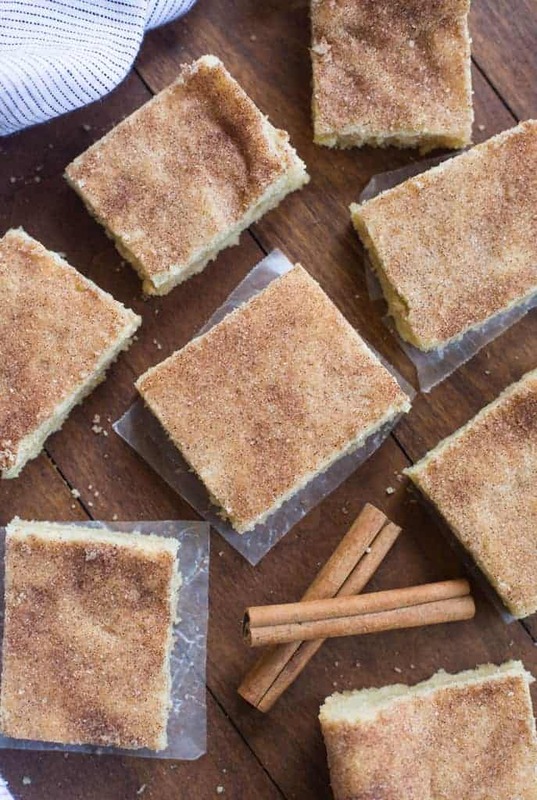 These snickerdoodle bars fit the bill in every way. Easy? CHECK. Super simple ingredients you probably have in your pantry already? CHECK. 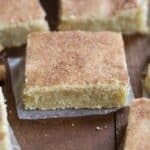 The easiest, tastiest snickerdoodle cookie bars ever? Triple check. If you are a fan of snickerdoodle cookies then you will LOVE these. Thick, soft and chewy and irresistible. 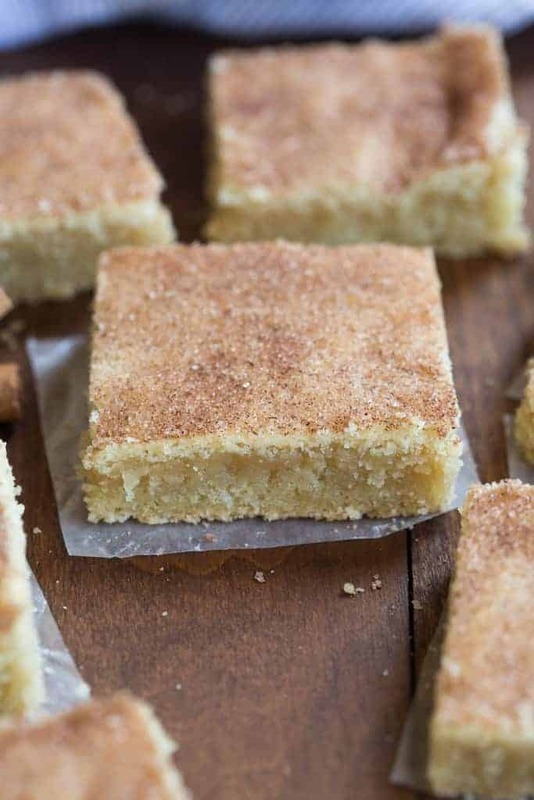 My favorite cookie recipe transformed into the BEST super soft and chewy snickerdoodle bars! No rolling or chilling--these couldn't be easier to make. Cream together butter, shortening, and 1 1/2 cups granulated sugar. Add eggs and vanilla and mix well. Add the flour, cream of tartar, baking soda and salt and stir until combined. Lightly grease a 9x13'' pan. Press the dough into an even layer on the bottom the pan. In a small cup or bowl, mix the 1 1/2 tablespoons granulated sugar and 1 teaspoon cinnamon. Sprinkle mixture evenly over the top of the dough. Bake for 22-26 minutes (don't over bake!). Remove and allow to cool completely before cutting and serving. I substituted 1/4 cup light olive oil for the shortening trying to make these healthier. The were wonderful..didn’t miss the shortening. Thank you. Have you substituted almond flour? Made these last weekend,and they were scarfed up immediately.GREAT recipe!!!! Oh my gosh! These are fabulous! Taste just like Smickerdoodle cookies but without all the rolling and coating. ???. I substituted coconut oil for the shortening as I don’t use that stuff. ? Can these be made a day or two ahead of time? Hi Doreen, I think 1 day ahead would be fine! More than that and I would suggest freezing them. Could you just use all butter instead of adding shortening? You can but it will change the texture of them. I suppose it’s possible to do them in a cookie sheet pan (possibly 1 1/2 times the recipes). I think they might lose some of their thick, chewy goodness :). I’d love to know if you try it! I have made these using vegan : using 1/2 cup of yogurt instead of the 2 eggs and it turned out Absolutely Delicious . I could not stop eating these. I also used vegan butter. I haven’t tried making this vegan and I’m so happy you shared your adaptations. Thanks Katherine!